All I Am Hutterite Books are to be collected TODAY and TOMORROW. I Am Hutterite Final Projects are to be posted on your WORDPRESS by Tuesday pm. 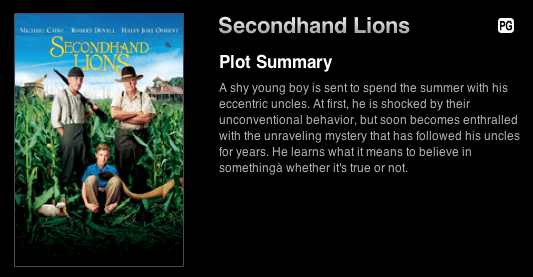 We will begin watching Secondhand Lions today. What is your question for EDITORIAL piece of writing? An editorial is an article that presents the newspaper’s/authors opinion on an issue. It reflects the majority vote of the editorial board, the governing body of the newspaper made up of editors and business managers. It is usually unsigned. Much in the same manner of a lawyer, editorial writers build on an argument and try to persuade readers to think the same way they do. Editorials are meant to influence public opinion, promote critical thinking, and sometimes cause people to take action on an issue. In essence, an editorial is an opinionated news story. 7. A solid and concise conclusion that powerfully summarizes the writer’s opinion. Give it some punch. 6. Refute (reject) the other side and develop your case using facts, details, figures, quotations. Pick apart the other side’s logic. 8. Repeat key phrases to reinforce an idea into the reader’s minds. How are your charts coming? How is your Photo of a Day coming? Examine an editorial page from two large dailies and two weeklies. What are the typical elements of an editorial page? How does it differ from the front page? What is the opinion expressed in each editorial? Who stands to benefit from the opinion expressed? What facts does the editorial writer use to support the opinion? How does the writer attempt to persuade readers? ← Thursday/Friday plans and Pie Day!